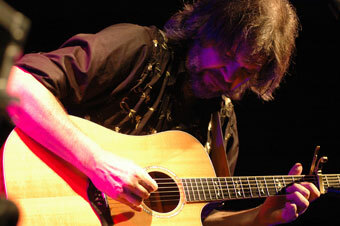 Widely acknowledged as one of Europe's foremost guitarists, Beppe Gambetta is a true master innovator on the acoustic guitar. Both solo and in collaboration with top-flight musicians around the globe (including stellar appearances at the Freight & Salvage in duo with David Grisman), Beppe has a style that's memorable both for its deeply emotive tone and for its technical brilliance. Still based in his birthplace of Genova, Italy, Beppe approaches his music from a unique stance, as an Italian musician in love with both American roots music as well as the music of his native country. He seamlessly bridges the shores of the two continents, creating a musical fusion where American and Ligurian tradition, emigration songs and folk ballads, steel string guitars and vintage harp guitars not only co-exist but interact, weaving a deep dialog unaware of any rigid classification. His newest CD, Rendez-vous, is a good example of Beppe's cross-pollinated style, featuring duet tunes from sources as far-flung as singer-songwriter Patty Larkin, newgrass masters Missy Raines and Jim Hurst, and jazz bassist Riccardo Barbera. Beppe's reputation in the U.S. and Canada is reinforced by his work with some great heroes of the folk scene like Gene Parsons, Doc Watson, and Norman Blake, as well as participation in prestigious festivals like Merlefest in North Carolina and the Four Corners Festival in Colorado. Beppe will be teaching the workshop Flatpicking "Globalization": New guitar styles combining elements from roots music on Friday, October 15, 6:30-9:30 pm.